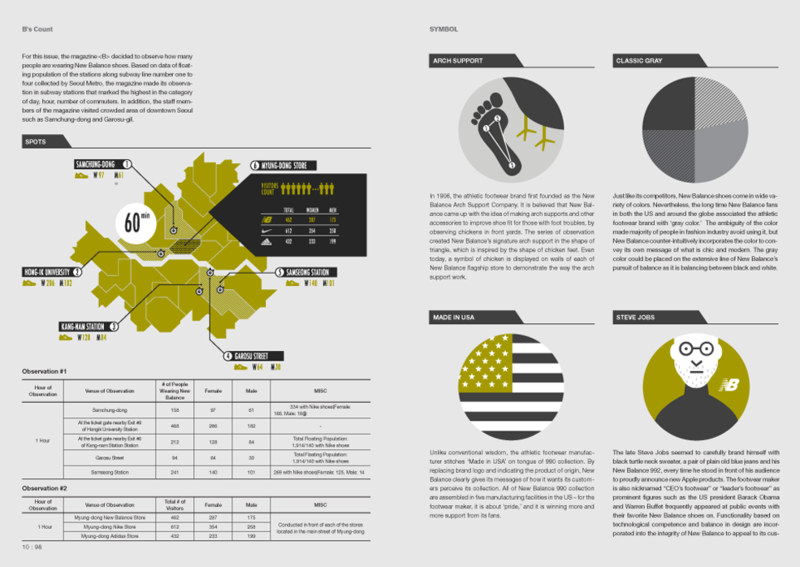 JOH & Company proudly presents its second issue of magazine B for this month. 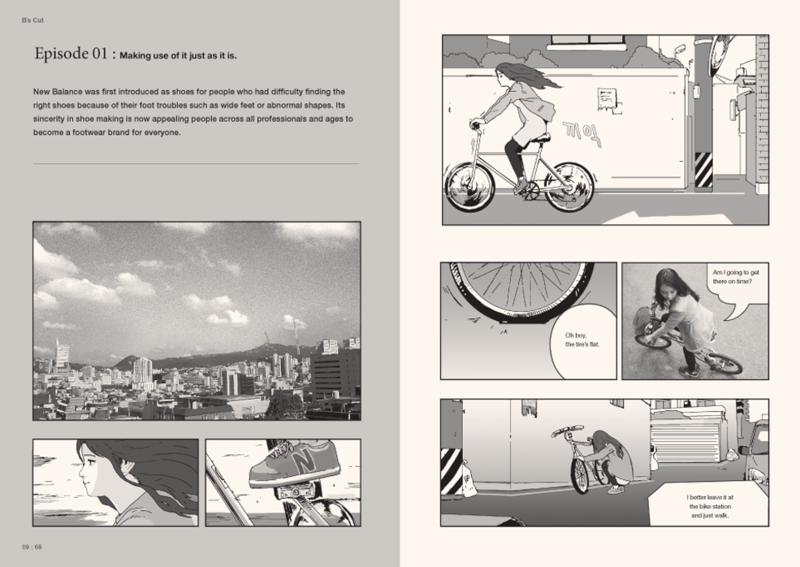 All staff members were overwhelmed by the release of the first magazine, but for the past few weeks, they have been under enormous pressure to meet the deadlines for the next issue and fretting over difficulties that they had to overcome to finally have the magazine distributed in the market. 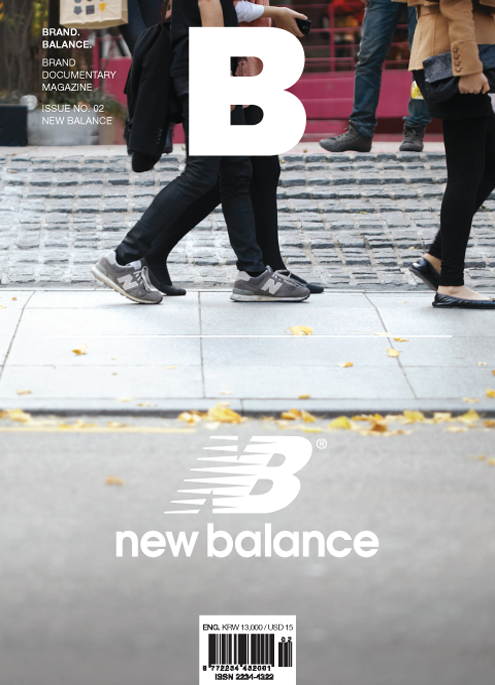 This month’s issue covers “New Balance.” As known by many, it is a footwear brand that produces running shoes and sneakers. 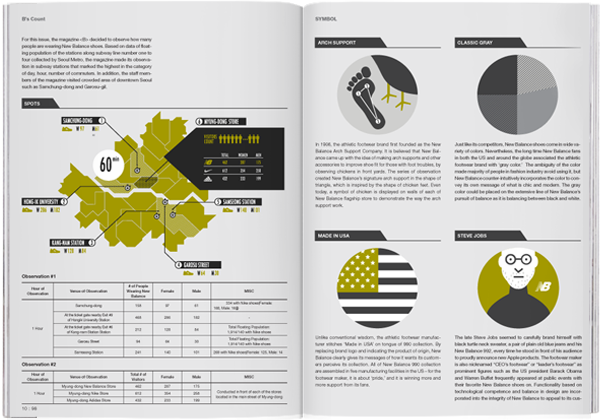 It is quite a different brand compared to ‘Freitag’ which was covered in our first issue. It is already popular but keeps up with its great work in maintaining its philosophy in the cutthroat competition with its rivals. 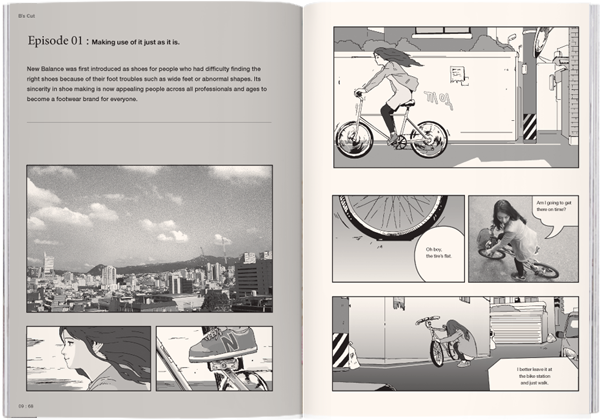 I began to see changes in my view toward the footwear brand after finding out that it had long been sponsoring Hyungjin Bae, an autistic marathon runner who was the model for the Korean movie titled “Marathon.” I don’t know if it’s because of the sponsorship but after knowing that it was hard for me to imagine perfectly muscular athletes in the Olympic games or the World Cup with New Balance on. Another moment was spotting Steve Jobs matching his grey New Balance with his signature black turtleneck and old blue jeans. It may be because I’d seen him in such style over and over, but it was hard for me to picture him with Nike shoes on for the Apple keynote speeches. A pair of New Balance with its basic and colorful design can be mistaken to look less cool even for celebrities or stylish people but fortunately, hardly anyone does. 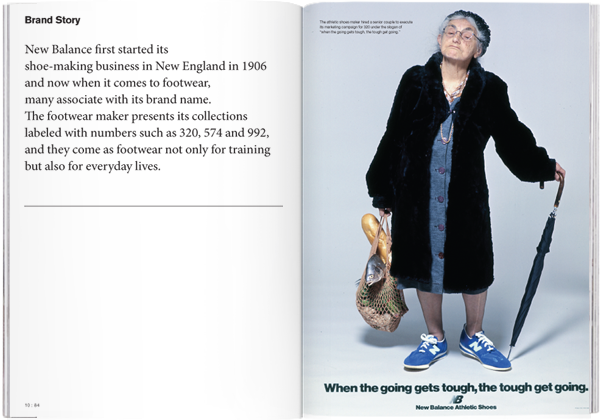 First, New Balance shoes are ‘genuine footwear.’ It originally began its business by targeting people with feet that were a bit off from average, for example, those who were over- weight, had wide feet or had trouble walking with deformed feet. While they concentrated on how shoes should be made, its design was less sophisticated and somewhat conventional but has now paradoxically appealed to us with its classic retro look. Second, unlike its competitors, New Balance avoids expensive and luxurious marketing campaigns with symbolic slogans such as “Just Do It” or “Impossible is Nothing.” Even if they had done it, not many people have noticed nor remember it. It is hard to deny that majority of brands have seen success in having products pairing with professional marketing strategies conveyed with strong ‘messages’ and ‘images’ but it feels quite different when looking at New Balance in such point of view.As New Balance gives all the tell-tale signs, it has established its unique brand image by putting emphasis on what it could excel at. The footwear manufacturing brand has been conscious to what it can be great at by offering nicely-fitting and comfortable shoes with variety of widths. I have often been referring brands with the above nuance as ‘B level brand.’ While I call brands with well-designed logos, great-looking models on TV ads, graphics with near perfection and sophisticated copies and thus become undeniable top-tier brands the ‘A level brand’, the ‘B level brands’ are brands that ‘look smaller’ than the ‘As’, with no interest in TV ads and stubbornly approaching the market with their prosaic logos, designs and communications. It’s quite clear that New Balance be placed in the ‘B level brand’ when compared to Nike or Adidas. The footwear brand does not have multiple numbers of fancy flagship stores worldwide, its marketing strategy doesn’t look globalized nor refined, and its design is close to conventional, rather than be sensitive to current trends. Nevertheless, New Balance’s tendency to stand aside from the trendy crowd, clearly shows their balanced novelty in the market. 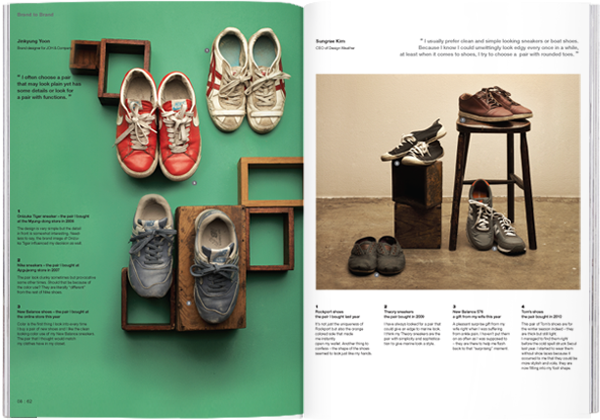 Magazine B focuses on the potential of New Balance that demonstrates a ‘different balance’ apart from their competing brands. And we hope that their faith would last for a long time. Busy crowd hustling and bustling in busy streets of downtown. 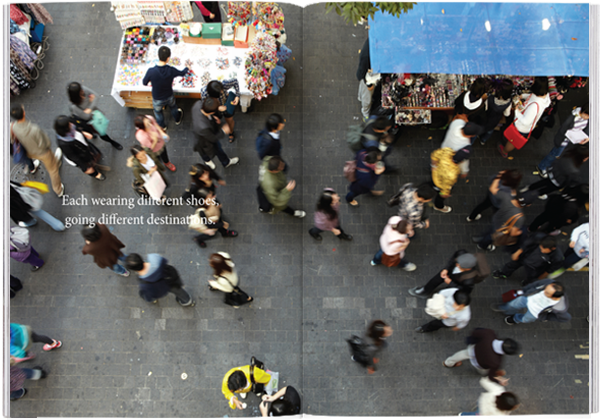 Each wearing different shoes, going different destinations. In every walk of life, a set of whole new experience is there to give one important lesson - life, in and of itself, is precious to all. He, an actor, used to be ignorant to fashion. 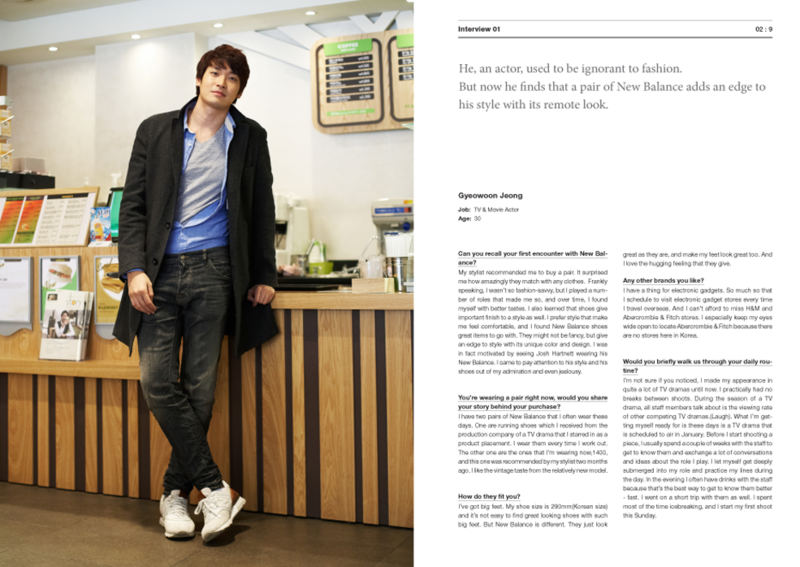 But now he finds that a pair of New Balance adds an edge to his style with its remote look. He has been a New Balance fan for thirteen years. He comments that they are lighter than Nike Air Max and look amazingly great with anything – even with formal suits. 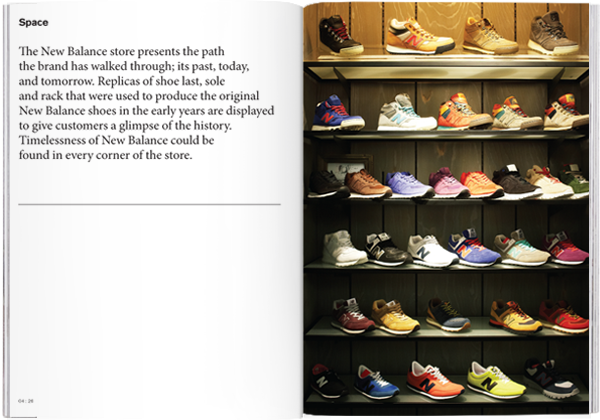 The New Balance store presents the path the brand has walked through; its past, today, and tomorrow. 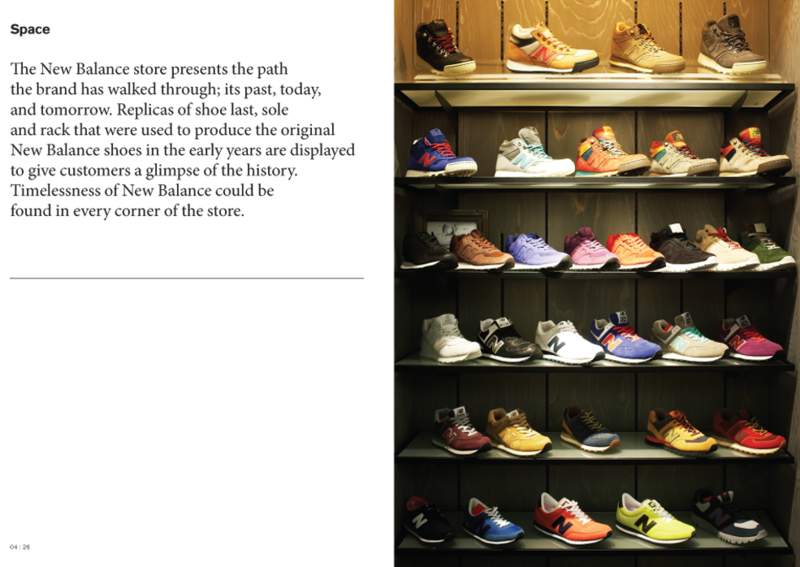 Replicas of shoe last, sole and rack that were used to produce the original New Balance shoes in the early years are displayed to give customers a glimpse of the history.Timelessness of New Balance could be found in every corner of the store. These two chefs, husband and wife, wish there were functional kitchen shoes that are as comfortable as their New Balance pair. All of 320, 574, 890, and 993 are signature collections of New Balance. Classic design of 320, currently the most popular, shows how its timeless design matches amazingly well with everything, even with formal suits with its thicker sole. Its state-of-the art running shoes, 890, is in fact suitable for many other occasions apart from running, and 993 seems to uncover its sincerity with its somewhat clunky design. This young lady enjoys going camping with her friends. 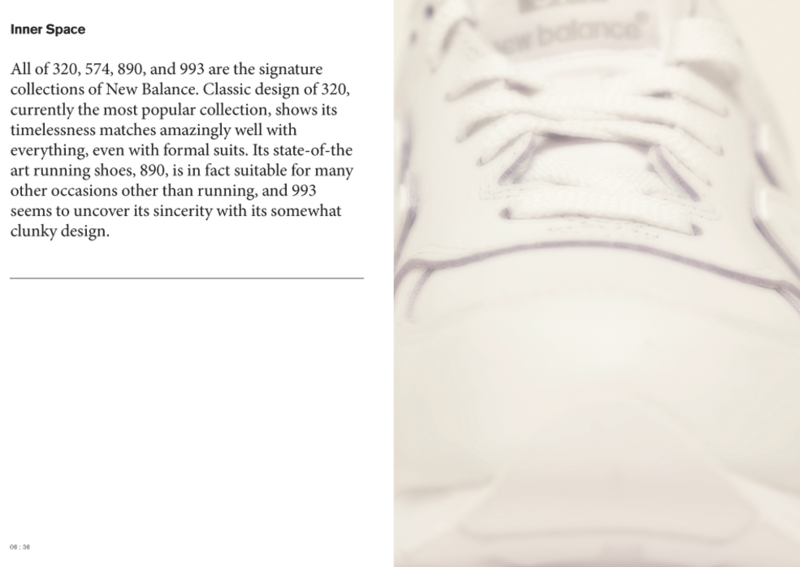 She notes that New Balance is a shoe of integrity. 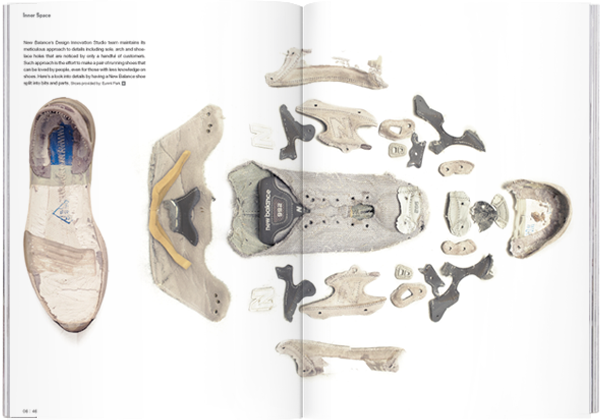 Shoes can be ‘ways and means’ for some, but ‘fashion items’ for others. 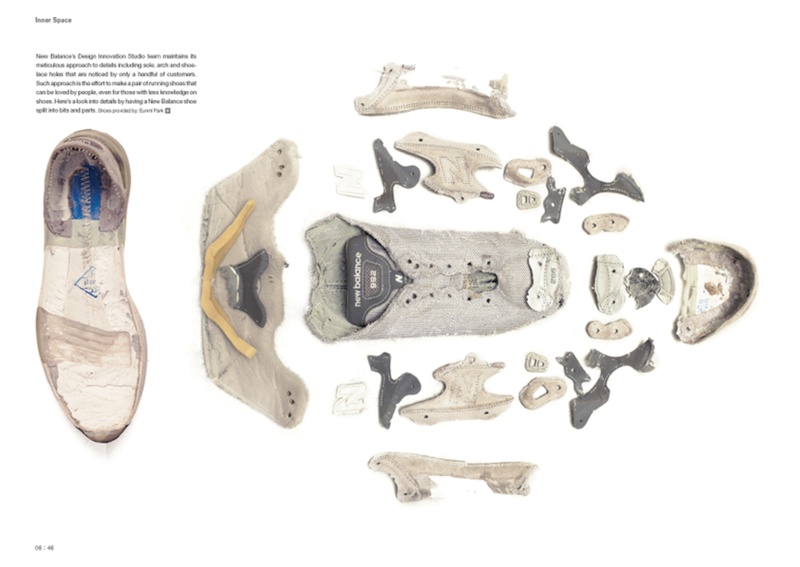 Here’s a look into shoe racks of New Balance fans, to find out what their own ‘definitions’ of shoes are. 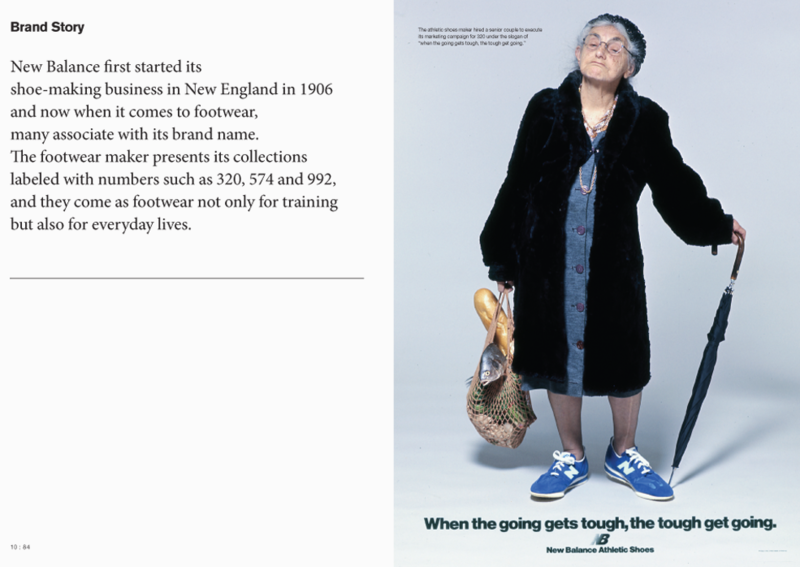 New Balance first started its shoe-making business in New England in 1906 and now when it comes to footwear, many associate with its brand name. The footwear maker presents its collections labeled with numbers such as 320, 574 and 992, and they come as footwear not only for training but also for everyday lives. This fashion-savvy art curator believes that sneakers should remain to be true to their functions as footwear. She adds that a comfortable pair of sneakers gives breath to her style. He is a corporate M&A manager.He prefers shoe brands that are more than comfortable - brands with its very own philosophy which only fashion conscious people would recognize. A walk along busy streets of downtown.No need to rush, no need to look around. In every walk of life, we would learn that a silent march along the path of life, in and of itself, is precious to all. 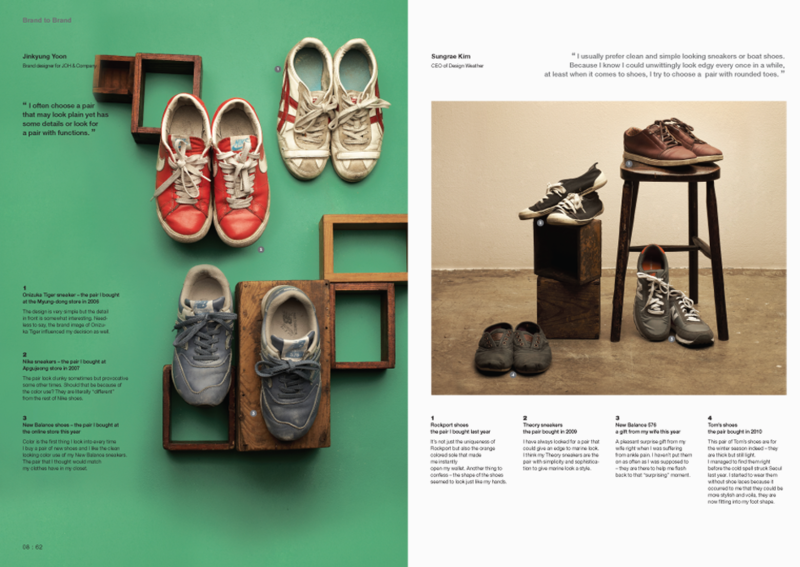 What each of us needs is a pair of shoes that gives balance in everyday lives.